When designing and constructing buildings the McAlpine’s of the 1st century would have had to contend with slippy clay banks sloping down towards the Walbrook river and periodic flooding. All in all not a nice place to set up shop. Never ones to be deterred however, the Romans built there anyway! If you imagine a house built on a slope there are broadly two main methods of construction one could use. Firstly by digging into the slope to form a level platform on the lowest point; or secondly by building a platform up to reach the highest point of slope. It is the latter the Romans decided to do in this case. 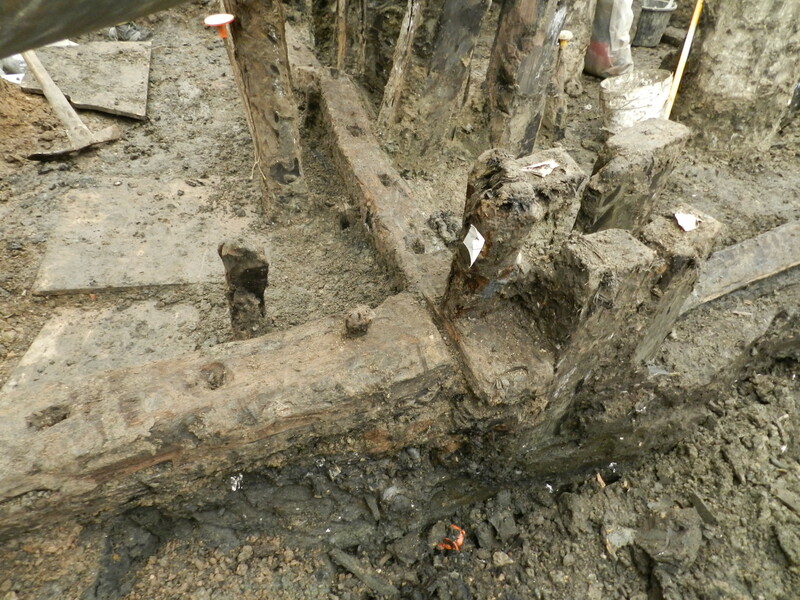 The first part of the structure to be uncovered were the base plates of the building. Nothing special about these, we had all seen base plates before! Once the extent of the building had been defined, the floor was uncovered and recorded. 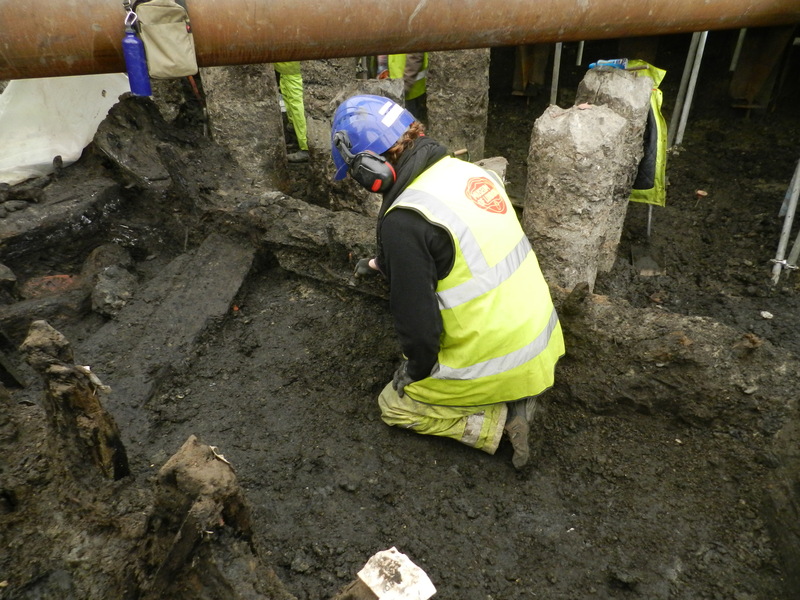 As the archaeologists began to excavate the floor they realised that there were further timbers beneath the base plates; what looked like horizontal planks on end and they appeared to be attached to the timber piles underneath the base plates so part of the same structure. 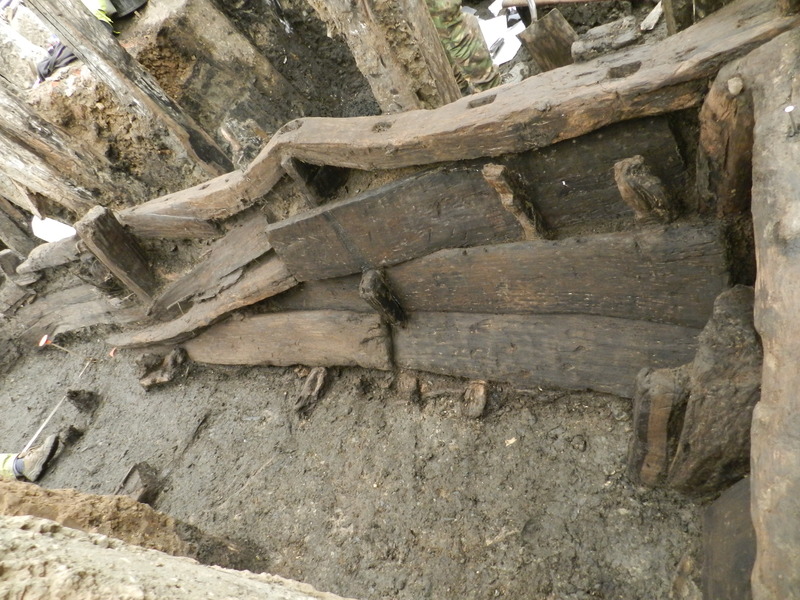 As such the soil in the center of the base plates was excavated to reveal an upstanding square timber frame. 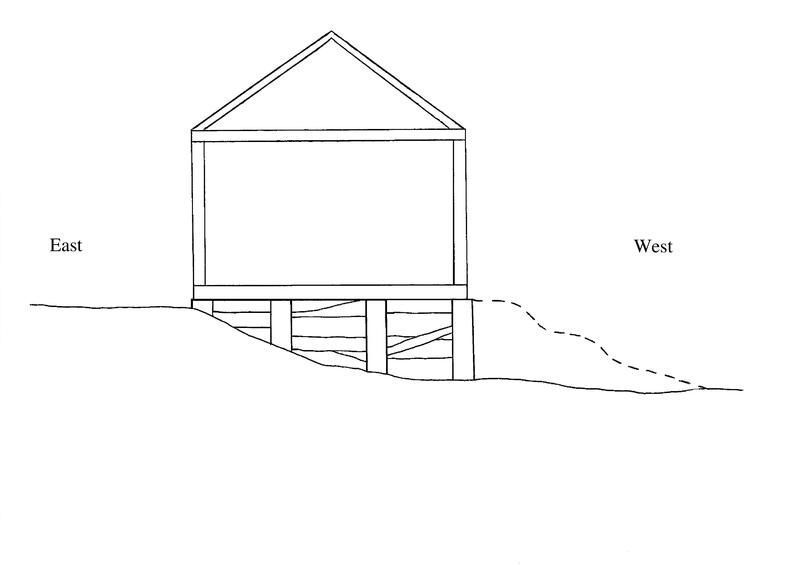 Three of the sides were constructed of thick horizontal timber planking, with one (the eastern side) being constructed of wattle. The frame formed a large rectangular ‘tank’ type structure roughly 4m across. The tallest part of the planking on the western edge reached approximately half a meter high. 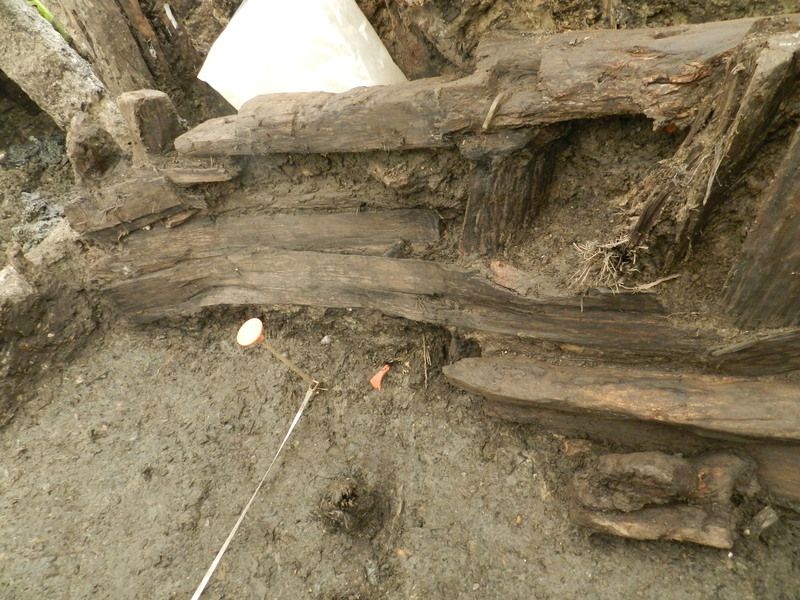 Leading down into the center of the rectangular frame from the north east corner were a series of wooden ‘logs’ that appeared to have been placed as steps. 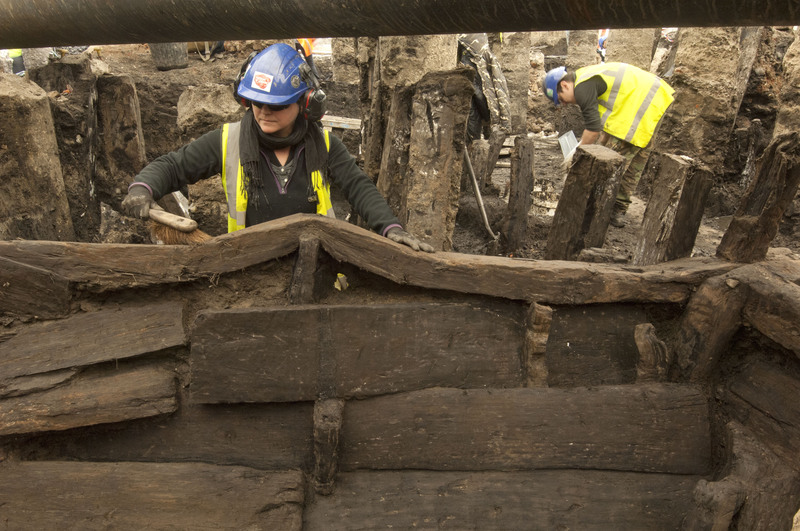 This impressive timber frame had been built onto the clay which sloped down to the west towards the Walbrook. This structure was back filled with soil to create the level platform on which the building stood. The steps had been used to gain access inside the structure allowing soil to be tipped inside to level the ground. The three sides that were formed of timber planking were the sides that would have bore the greatest pressure, being down slope. The side of wattle was at the top of the slope and was more of a boundary than a support. The floor of the building and the base plates would have been placed on top of the back filled ‘tank’ and would have been level with the highest point of the slope. It appeared that the ground outside the building to the west was built up as well to allow access into the building. Crude steps were cut into this material, much like the type of steps archaeologists cut into the sides of trenches for access today! The timber used in the frame was mainly reused planks or off cuts. Apart from the base plates none of the pieces seem to be purpose cut. Bits of twig and branch had been used as fillers and chocks.